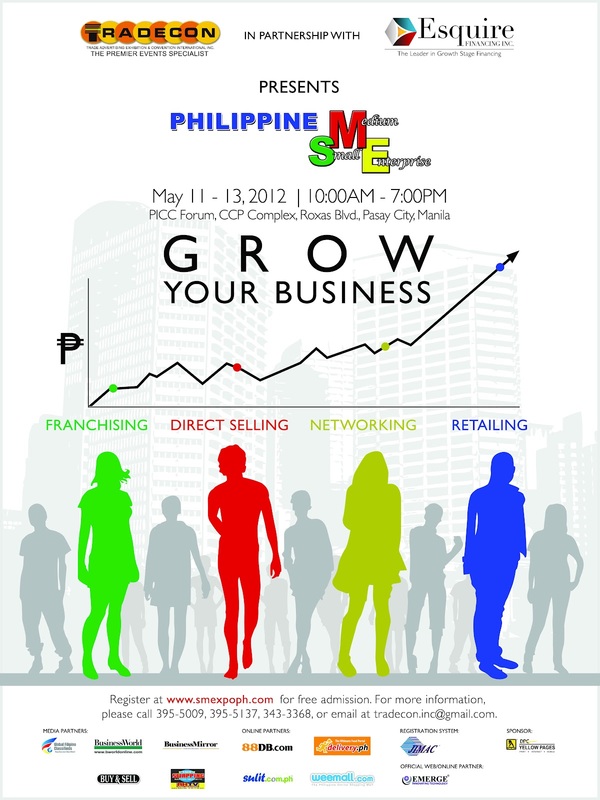 If you are an aspiring businessman, an established business owner, a budding entrepreneur or an interested consumer, come and be part of the 4th Philippine Small Medium Enterprises and Franchise Expo (PHILSME EXPO 2012) to be staged at the Philippine International Convention Center (PICC) on May 11, 12 and 13. This year’s three-day retailing, direct selling expo just got bigger and better, with the partnership forged between organizer Trade Advertising Exhibitions & Conventions International Inc. (TRADECON) andthe country’s leader in Growth Stage Financing, ESQUIRE Financing Inc. (EFI). A company dedicated to furthering the venture of growing small and medium enterprises (SMEs) by offering them specialized and FAST business solutions, Esquire Financing Inc. believes in the significance of bringing together the SME owners and various publics (investors, clients, consumers, distributors, and suppliers, among others) to interact and tap into one another’s potential contributions to the emerging small and medium enterprise market. SMEs play a major role in the country’s economic development as they contribute to the creation of business opportunities, generation of employment, and linkages to existing industries both here and abroad. Various SME players from direct selling, agriculture, hotel and restaurant management, banking, marketing, insurance and service providers will be setting up their kiosks for the three-day expo. As of 2009, small and medium enterprises comprise 99.6 percent of the almost 80,000 business enterprises operating in the Philippines and employ about 63% of the labor force, especially in the NCR. The 4th Philippine Small Medium Enterprises and Franchise Expo (PHILSME EXPO 2012) will also provide opportunities for idea exchange and product demos for budding businessmen, as well as a great deal of free services, workshops and seminars, classes and new product launches. At the press conference held recently, ESQUIRE Financing Inc. President and CEO RajanUttamchandani expressed optimism at the country’s business environment this year. Chinkee Tan, wealth coach and motivational speaker, also expressed his support for the upcoming expo and is encouraging each one to awaken their entrepreneurial spirit and engage in business that they're good at and interested in. For assistance, contact TRADECON at 395-5009, 395-5137, 343-3368, or email events.tradecon@gmail.com. You may also contact Esquire at http://esquire.com.ph/ or call (02) 903-0159, 846-2923 or 846-3074.